Students have the opportunity to vote on a proposed increase in athletics and transportation fees. 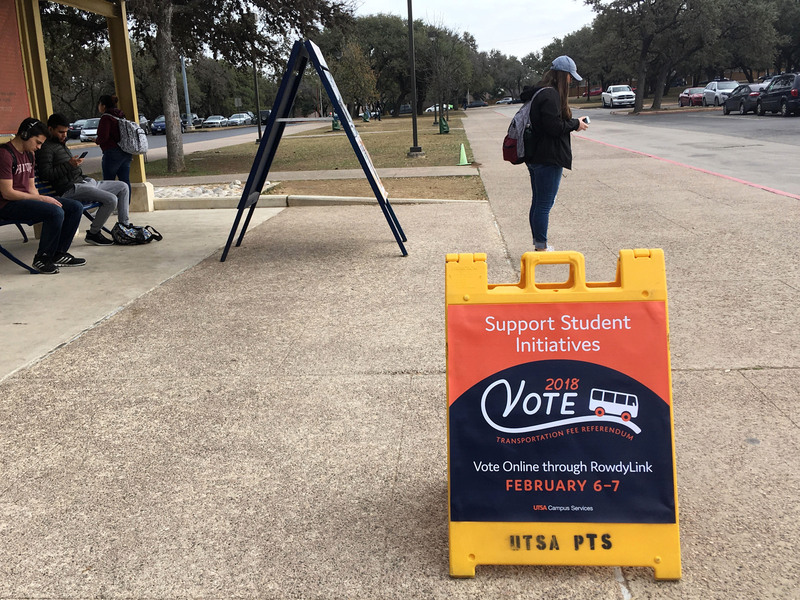 On Feb. 6 and 7, voting will open on UTSA students’ RowdyLink accounts, where they can vote on each fee increase. The current athletics fee is $20 per semester credit hour, with a cap at 12 hours ($240). The proposed increase would be to $21 per semester credit hour for the 2018-2019 academic year and $22 per semester credit hour for the 2019-2020 academic year. The fee was origianlly capped at $120, which was removed in 2007 when a student referendum vote to increase the athletics fee to $240 was passed. The transportation fee is currently $20 per semester. The proposed fee increase would be to $29 per semester for the 2018-2019 academic year, and to $38 per semester for the 2019-2020 academic year; the transportation fee does not have a cap. “We need to continue to build our athletics program to remain competitive and attract the very best students, both on the playing field and in the classroom,” Lisa Campos, vice president for intercollegiate athletics and UTSA athletic director, said. “We all fully recognize the rising cost of education and the impact it has on our students. If this increase is approved, it would still remain 20 percent lower than the Conference USA average. 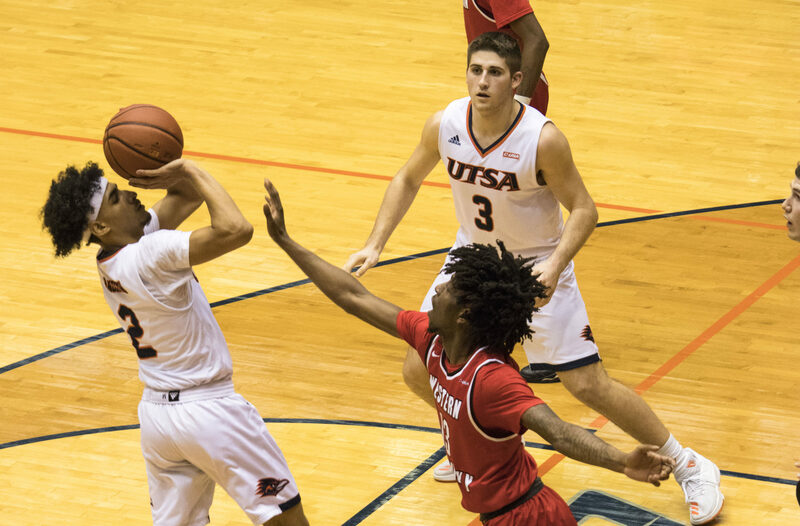 UTSA basketball player avoids a block. According to a voter guide issued by UTSA Student Government Association (SGA), the increased athletics fee is earmarked for the recruiting student athletes, maintaining and upgrading athletic facilities, upgrading video equipment and hiring staff to televise programs at Conference USA standards. 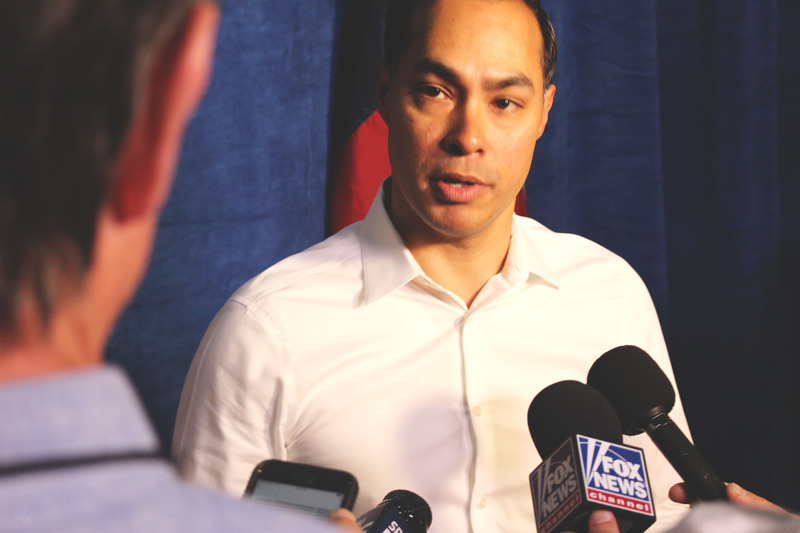 According to Jerry Sharp III, an author of the voter guide, UTSA administration requested the voter’s guide be revised, citing a problem with the tone. Some students oppose an increase in the student athletic fees. Rebecca Saenz, junior English major, believes the fee increase does not benefit her or other students who do not participate in UTSA athletics. “I’m not excited to hear about the fee hike,” she said. “I’d like to see the money going to other academic benefits gleaned by everyone, things like improved classroom utilities. “I think students would rather avoid new fees altogether since college is already so expensive,” Saenz said. Clarissa Cabello, also a junior English major, expressed similar comments. Montana Meeker, sophomore finance major and SGA secretary, offered her own perspective. “The proposed athletics increase is a clear indicator of where the UTSA administration’s priorities lie,” she said. “It is irresponsible and arrogant to invest in programs that will provide nebulous benefit to the overall student body. Yes, it may increase name recognition of the college at sometime in the future, but if UTSA creates quality students with the skill sets needed for successful careers, recognition will follow. Signs advertising the referendum vote are posted around campus. “UTSA should and could be using student funds to give back to the students here and now, not ‘at some point in the future once our football team makes it.’ Vote against the athletics increase and push for UTSA to build equity in academics, not athletics,” Meeker said. The Auxiliary Enterprise Funds (AEF) accounted for over 13 percent of UTSA’s $582,707,268 operating expenses budget in the 2016 to 2017 fiscal year; the AEF includes budgeted expenses for UTSA sports, housing and child development center. However, the athletics program made up nearly 37 percent of the AEF’s budgeted expenses and accounted for just over 21 percent of its estimated income. The football program alone accounted for nearly 12 percent of budgeted expenses and only accounted for nearly four percent of the estimated income in the AEF’s budget. These numbers do not account for neither the recent increase in the salary of Head Football Coach Frank Wilson or the increase in student enrollment. In the 2016-2017 school year, the athletics fee consumed nearly 17 percent of all mandatory student fees, making it the second largest student fee after the Automated Services Charge. Both the athletics and transportation fees are mandatory. Voting for the referendum will conclude at 11:59 p.m. on Feb. 7.